Relate: About a month back I landed in the airport of a strange land I had never visited except in my prayers. With me I carried three suitcases, the two larger of which could not way over a hundred pounds. (They weighed in at 87). All that was in those suitcases was the sum total of my remaining possessions. Everything else had been sold or given away. Without a doubt, the hardest part of that pairing down process was the elimination of my library. To say I had hundreds of books would be a lie. It was closer to a couple thousand. Roughly half of these were theological in nature and a good chunk of the rest were history or science. I had to let go of treasures like The Bible, Rocks, and Time by Davis Young, The Fabric of the Cosmos by Brian Greene, and Chaos by James Gleick among many, many others. These three, and plenty of other books have broadened my perspective, taught me more about this wonderful world our Creator has made, and given me a better understanding of who He is. Science is a great teacher. It is an excellent tool and any Christian who fears it or its findings only demonstrates their personal lack of faith in a great big God who beggars definitions, defies limitations, and destroys the boxes we are so desperate to create for Him to keep ourselves comfortable. But science has its limitations. My first attempt at blogging more than a decade back took place in a forum that has become a ghost town called myspace. In my second blog on that site I proposed two difficulties that science and in the decade since I have still seen no adequate answer for them. I call these difficulties the pendulum problem. If I were to start a pendulum and take accurate measurements, I could soon use math to chart exactly when and where that pendulum would reach the apex of each swing. I could tell you exactly where the pendulum will be at any given future moment in time. I could also work backwards and tell you where the pendulum has been at any moment in the past as well. The problem is, those math equations will not be able to tell us where and when my single, non-repeatable event of starting that pendulum took place. The numbers would push right past that moment into a fictitious past. In fact, if the further I go back, the more ridiculous the numbers my equations calculate would begin to look. The math that works so well for the present, future, and recent past simply become useless when an outside factor changes the game. For the second problem, we need to imagine that our pendulum is the entire universe. It has been created and set into motion and those on that pendulum might be able to figure out a lot about the world around them. They might be able to create a workable series of laws about the what, where, and how of everything they are able to know, which is that pendulum universe. But those on that pendulum would never be able to understand the why of the pendulum, the origins of it, or anything of any existence outside that pendulum. They would believe the existence of that pendulum is the sum of everything without realizing that it is merely a tool serving a greater purpose. All of this would be impossible for them to know unless it were revealed to them by someone or something that exists beyond their pendulum. React: Science has its place. It is a very important one. But science does not have final say. It can tell us much about our world, but there has been one who has come into our world from beyond it. He became one of us so that we can understand Him and emulate Him but He is far, far greater than the stuff of this earth. This intricate, amazing, beautiful, breathtaking world of ours is His work of art. As am I. So are you. He loves us and He loves it and when we learn to do the same, we can better begin to understand Him. God, don’t let me ever lose the passion to learn more and more about You and this wonderful world You have made. You are the star breather. You spread out the galaxies with more ease than I pull aside a curtain. You have named each and every star, yet You have also counted every hair on my head. OK, that’s not hard, but for some other heads… You have not only set in place the tiniest particles in the quantum world but also continue to hold everything together by Your power. All of creation reveals Your greatness, and wisdom, and brilliance. Let me do the same. Here at RCG we aim to encapsulate the online Christian world. I have been subscribed to this blog for about a year now and love the daily posts. Well said, my friend. The visual of the universe as a pendulum is amazing. I come from a family of atheists who say, ” christians are too stupid to be scientists. Saying you’re a scientist and a christian is an oxymoron because christianity is acceptance of made up stories that have nothing to do with fact.” I believe our God is an infallible God, but that we’re imperfect and that God is the mind behind the intelligent design, the will, the way. The more I understand about science, the more clearly I see the hand of the Creator. Great post! The “Pendulum”! I really like this. It is a great scientific explanation of what is happening, how it continues to happen but cannot explain when it started to happen or even how it started. I will remember this post. Thanks for your thoughts and wisdom. As the pendulum swings, so does ones life. While one was not aware of the moment when their life began, it began all the same. We see the motion of the pendulum and can scientifically find answers to how fast and when it will reach each position of it’s movement, we cannot find when or how it started. While science searches for the begining of time, when this all began, it misses the target that someone had to start it, someone had to build the pendulum, someone was in the begining. 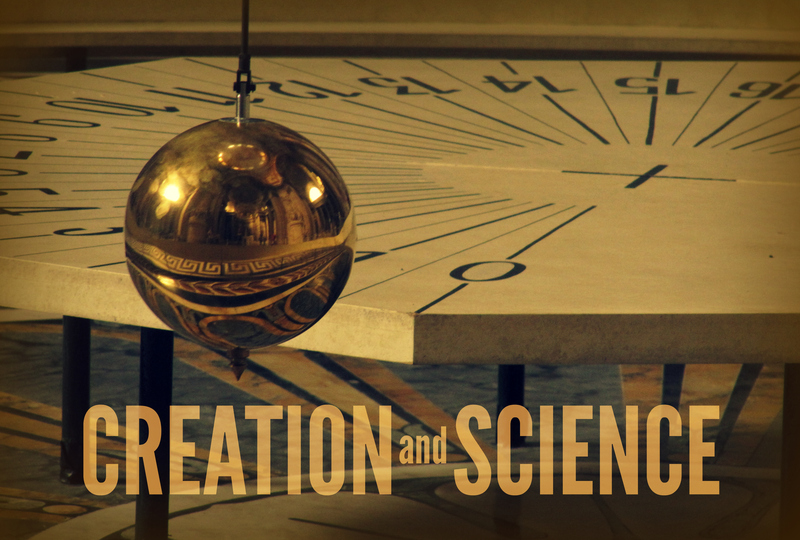 A “Think Tank” question: who started the pendulum of life? Thank you, and praise God, for the excellence of your posts. It is wonderful how God is blessing you and how your pour that blessing out. I never tire of reading your posts! “Science is a great teacher. It is an excellent tool and any Christian who fears it or its findings only demonstrates their personal lack of faith in a great big God who beggars definitions, defies limitations, and destroys the boxes we are so desperate to create for Him to keep ourselves comfortable.” -This is completely true. Thanks for sharing! Sorry, but I have to challenge you on word “exactly”. Your stamen reveals, that you are overestimating, mystifying math. That is you hold that math is infinitely accurate and able to describe, or even command how reality works. This is clearly not the case. If this would be the case, scientist would not need to build expensive instruments which goes “ping” (jk), to test that their math at least accurate to some degree. All they would have to do is to work out the math and we could be absolutely sure that reality is the same. Of course this is not what happening and rightly so. Math at most can give us a very accurate estimation but not exact description of how things work in the universe around us. True, the math for the pendulum would only be exact in a vacuum. There would be other factors that must also come into play like wind, barometric pressure, etc. But the problem would not be in the math but in knowing what and how these factors would be accoumted for in he math. No! The problem would be the math! Even if we could allow for all influencing things in the math. It still would be impossible to predict exactly where the pendulum would be. One of the problem is, we have to use Pi in our calculations, as the movement of the pendulum is on the circular path. Since we cannot have the exact value of Pi, just an approximation (3.14 …) the result also will be an approximation, therefore not exact. To suggest belief is impossible for a scientist is silly for many do believe. Christianity has adapted to science we now have big-bang Christians and the Pope accepts the big bang theory. Those Christians who hold rigidly to the Bible account are becoming fewer as science produces more evidence for the great age of the universe. The main problem with Christianity is in the realm of ethics.